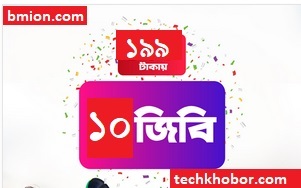 Enjoy 10 GB (7GB Regular + 3GB 4G) at Taka 199, only on Robi. Recharge 199 Taka to avail this offer. Validity 7 days. Dial *3# for data balance check. After completion of pack volume or validity, you will be charged at Pay-As-You-Go rate @ 1Tk (+tax) upto 5Tk as Pay-per-use. VAT, SD & SC is included.